Well, the holiday season officially comes to a close today at the Disneyland Resort. Tomorrow marks the start of one of the rare slow seasons at Disneyland and Disney California Adventure. 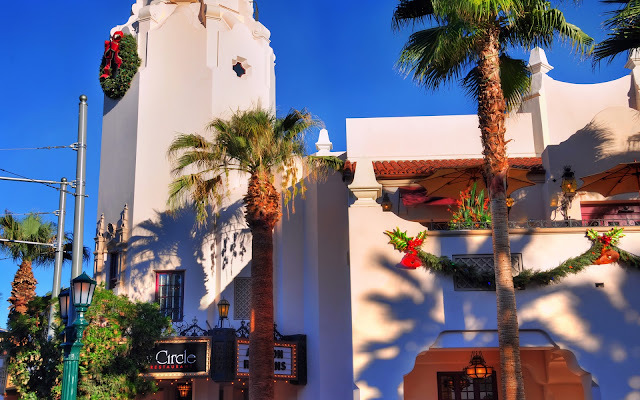 So I thought I'd mark this by posting one more holiday-related photo, this one from the Carthay Circle Restaurant, in Christmas regalia. The festive dressings really add a nice touch of color to an otherwise stately and elegant building, and give a sense of liveliness to the architecture. Simple but stylish--like all of Buena Vista Street! A look at the Carthay Circle Restaurant in holiday wreaths and ribbons!